A new study reveals that the carbon footprints for African cities are rapidly deteriorating because their population is growing faster than cities elsewhere in the world. Yet the ecological impact of this development is almost completely ignored because it’s hardly being documented, according to the study’s author, Joy Clancy, a Dutch scientist. “One of the most important ecological changes in Africa’s history is being over-looked”, according to Ms Clancy, who published an abstract of her research in the African Journal of Ecology. She provides a first hand insight in the worst side of the problems, pointing out that demand for fuel wood and charcoal isn’t really the biggest cause of deforestation in Africa. A far bigger factor in deforestation is change in land use, according to Ms Clancy. She says the most dramatic change is around cities – the ‘peri-urban’ areas – where woodlands are cleared for agriculture to feed the new centers of population. Clancy believes that this, in combination with the effect on water demand and waste disposal on aquatic ecosystems, means that the carbon footprint of African cities is bound to be much larger than their current footprint calculations suggest. 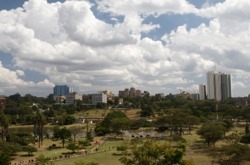 But there is little research on the environmental state of play of Africa’s cities. Africa is famous for its wildlife and the ecology of places such as the Serengeti are familiar to people all over the world, but remarkably few ecologists are studying urban environments” says Jon Lovett, associate editor of the African Journal of Ecology. Clancy’s article follows a ministerial conference in Johannesburg last Spring about the environment which saw the release of a WWF and Footprint Network report about Africa’s ecological footprint. The report ‘Africa: Ecological Footprint and Human Wellbeing’, reviewed the continent’s ecological resources and the role these can play in advancing the region’s human development goals – or, if mismanaged, in thwarting them. The main trend in the report underscores Clancy’s concerns, indicating that Africans are depleting their land at a more rapid pace than any other continent, despite having rather modest personal carbon footprint levels. The average African had an Ecological Footprint of 1.1 global hectares in 2003. That’s half of the average of the ‘world citizen’, which scores 2.2 hectares. But growing number of African countries are fast depleting their natural resources or will shortly be doing so – at a quicker pace than they can be replaced. Globally, world consumption exceeded biocapacity by 25 per cent in 2003, a measure sometimes expressed in terms that the average world citizen requires the resources and pollution absorbing capacity of one and a quarter worlds, with projections that humanity will require the resources of two planets by 2050 on current trends. However, several African nations are “ecological creditors,” they produce more biocapacity than they consume. This stands in contrast to U.S. and Europe which are ecological debtors. The U.S., for example, has a Footprint more than 100 times larger than its biocapacity. Many opportunities exist in Africa to manage and use biocapacity more effectively. Whether providing exports or sequestering carbon, an accurate accounting of demand on, and supply of, biocapacity can help determine if its use is being valued appropriately. Africa’s biocapacity overall is 1.3 global hectares per person, slightly more than Africans use, but 28 percent less than the world-average of 1.8 global hectares per person. Clear dangers loom from a projected more than doubling of Africa’s population by 2050 on moderate estimates, with the continent’s share of world population increasing from 13 to 22 per cent.